Vincent Janssen’s second-half penalty was not enough to prevent Tottenham from being eliminated at Anfield. Daniel Sturridge celebrates against Spurs. DANIEL STURRIDGE SCORED both goals as Liverpool overcame Premier League rivals Tottenham 2-1 at Anfield tonight to seal a place in the quarter-finals of the EFL Cup. Sturridge, who hasn’t scored in the Premier League since April, turned in a loose ball inside the area to break the deadlock in the ninth minute before converting a one-on-one opportunity in the second half to double both his and Liverpool’s tally. His second brace in this season’s competition — he also scored twice in a 5-0 victory at Burton Albion in the second round — settled an all-Premier League affair that pitted the League Cup’s last two losing finalists. Vincent Janssen converted a 76th-minute penalty to half the deficit but Tottenham’s unbeaten run in all competitions came to an end at eight games. Managers Jurgen Klopp and Mauricio Pochettino used the fixture to demonstrate the art of rotation, the pair combining to make 21 changes from their respective line-ups that started in league action at the weekend. Klopp handed starts to Trent Alexander-Arnold and Ovie Ejaria, although it was a familiar face who put the hosts ahead. Despite failing to find the net in the Premier League so far this season, Sturridge seized on an unexpected opportunity to end a goal drought for his club that stretched back to 23 August. The England forward reacted quickly to tuck home a rebound after Marko Grujic’s shot was partially blocked, the ninth-minute goal punishing Georges-Kevin N’Koudou’s untimely slip that had surrendered possession just outside his own penalty area. Later, Sturridge’s curling left-footed effort was tipped over by Michel Vorm, while an attempt with his weaker right was scuffed straight at the Tottenham goalkeeper, wasting excellent build-up play Divock Origi. At the other end, the visitors’ one real chance of note in the first half fell to Janssen, as his left-footed drive from a tight angle forced the recalled Simon Mignolet into a smart low save. Grujic dragged an effort wide of the target in the 38th minute after he had been put through by Sturridge’s pass, while the latter let the visitors off the hook early in the second half when he fluffed his lines from Origi’s low cross. Vorm tipped over Origi’s stinging drive from outside the area just prior to the hour mark before Sturridge struck again. From a throw-in deep inside their own half, Liverpool moved the ball quickly forward and Georginio Wijnaldum’s through-pass set Sturridge clear of a high defensive line to fire the ball through Vorm. Erik Lamela coaxed a clumsy tackle out of Lucas Leiva to win a spot kick that Janssen fired home, yet Tottenham were unable to find an equalising goal in a frantic finish. The woodwork denied Sturridge a hat-trick, as an audacious chip was kept out by the bar with Vorm beaten, but his double proved enough to keep alive Liverpool’s hopes of lifting the trophy for a ninth time in their history. 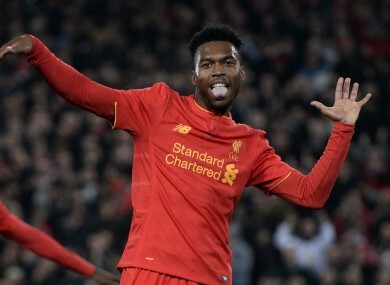 Email “Sturridge rediscovers goalscoring touch to fire Liverpool into quarter-finals”. Feedback on “Sturridge rediscovers goalscoring touch to fire Liverpool into quarter-finals”.